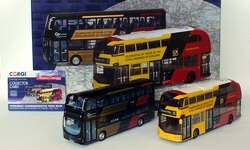 This page contains details of all the forthcoming models that have been announced to date in Corgi's Original Omnibus Collection range. To view model releases from other manufacturers please use the links provided below. and due to manufacturing constraints are often subject to change. To view a list of OOC models already released this year please follow the link below. Corgi has confirmed these release dates. The expected release dates shown below are based on the latest information provided by Corgi & may be subject to further change. No new OOC models were announced in the 2019 Corgi catalogue. It's not yet known if this indicates the range is being discontinued by Corgi. No further Corgi OOC range models are currently planned in 2019.